Discussion in 'Scotland' started by C-bus, Jan 23, 2011. ^ As much as he deserves to be sacked, it's a loss for Hearts in as much that he was/is a very promising young player. I read today that Vlad plans to move him on to one of his other playthings, MTZ-RIPO or something like that. Done because it was the right thing to do, or because they didn't want any more sponsors withdrawing? I'll hazard a guess at the latter. Was it the right thing to do? Why? Why does someone convicted of a crime deserve to lose a job that, otherwise, they are doing well in? To satisfy some people's need for vengeance? He's been punished by the courts and suffered a very public humiliation. That's been deemed enough. It's not up to Hearts or anyone else to dole out their own punishment. I totally agree that he can't play in Scotland again. But If I was Hearts, my first instinct would have been to try and get him moved to some foreign club. He's a 20-year-old man (yes, 20 years old is young, but he's a man nevertheless) who admitted to perving on young girls, one as young as 12. If that was my daughter I'd want the c*nt's balls on a platter. From what I can gather, the overwhelming majority of Hearts fans are glad to see the back of him as much as the rest of us. As I've said, he's young and no doubt naive, but at the same time it's awful PR from Hearts' point of view to be employing someone like that. 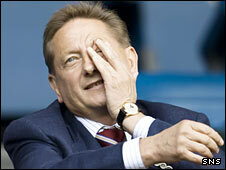 Even Romanov admitted as much by sacking him, albeit in the wake of intense media pressure and public opinion. Which Romanov is in the process of doing. He allegedly raped someone. And that person happened to be over 16.
all the more reason for rangers to sign him up. Wait...you'll pay money to see Hearts? It has been a good two days. In order to resign [sic] him, he would first have to have cancelled his original contract. Craig Thomson hasn't re-signed for Romanov, he was never released by Hearts in the first place. He's been sent to Lithuania to get out of the limelight in order to appease Hearts' sponsors. He'll either be back when Romanov feels it's all blown over, or his contract will be terminated by mutual consent after the Lithuanian season ends in November of this year. Thereafter I'd imagine that he'll skulk around the central European leagues for a while in ignominy. Great find! I hate reading online but there's only one used copy of this book for $85 on Amazon so I'll get over it. No Hearts on justin.tv At least we're winning this one. The former D.C. midfielder apparently has a new home. US international Perry Kitchen is in the Hearts squad to face FC Infonet Tallinn in their Europa League opener tomorrow. The second round of Europa League qualifying began on Thursday night, with Hearts midfielder Perry Kitchen pulled due to a hamstring injury during the first half of a very muggy, scoreless draw away to Maltese side Birkirkara. I don't know what's more awesome. Kitchen getting captian, or Soccer America still existing as a 1990's styled website. stphnsn, chungachanga and msilverstein47 repped this. Hearts added 18-year-old Polish goalkeeper Wojciech Gajda to the squad. The youngster joins on an amateur contract from the American club New York Red Bulls. He will sign professional terms when the January transfer window opens.